Redwood National Park is known for some of the tallest Redwood trees in the world. As a haven for RV campers and nature lovers, the Park hosts thousands of tourists and guests each year. With scenic imagery and picturesque backdrops, the area is also known for its immaculate beauty and wildlife preserves. 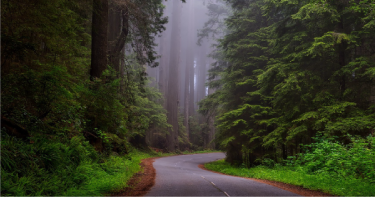 From annual Boy Scout jamborees to miles of hiking, biking, and cycling trails — Redwood National park is governed by the National Park Service and California State Parks Administration. The area is also synonymous with vast prairies, oak woodlands, and nearly 40 miles of rugged coastline terrain. Redwood National Park offers visitors a myriad of interactive programs. In fact, tourists and campers can book guided walking tours with knowledgeable and seasoned park rangers. Similarly, the Park features lectures for those that want to learn more about the history of this National Park. The Visitor’s Center also features interactive exhibits for one all, as well as Safety Watch Wildlife programs and scenic drive tours. From Elk and Bears to Banana Slugs, you can truly experience Mother Nature at her best with any Park tour or drive. With ample parking and easy-to-follow roads and trails, you can truly enjoy camping under the big Redwood sky and stars. Similarly, you are in close proximity to all campsites, along with nearby lakes and nautical — aquatic activities. Redwood National Park features hundreds of nature trails and paths. From hiking and bicycling to nature walks, these trails are the perfect way to experience Mother Nature. In fact, you will find ample opportunities to take some memorable photos, while truly cherishing the memories. The Visitor’s Center also offers detailed maps of all Redwood nature trails. This too is a great way to learn more about the campgrounds, along with safety measures and emergency contact numbers. Redwood National Park also has some of the best fishing in the country. In fact, the Klamath River is the best place to fish for freshwater trout and salmon. You can also enjoy your catch on-site with barbecue or fire pits. Fishing at Redwood is also a great way to spend quality time with loved ones and friends. While you can no longer find eulachon and tidewater goby species, there are plenty of seasonal trout and salmon in the Smith River and Redwood Creek areas. If planning to take your RV rental to Redwood Park, there are some restrictions to keep in mind. The maximum RV trailer length at most Redwood campgrounds is 35 feet. However, some campgrounds have extended the length to 40 feet due to limited turning radius. You need to contact the Redwood National Park Visitors Center to find out more about RV or home-trailer parking and pad sites. Again, there are parking lots available — but also paths and trails you can drive your RV on to the campsite.